Global biopharmaceutical leader, AbbVie will be on campus recruiting junior & senior CHE, IE, ME, BIO, and BIOCHEM majors for fulltime, semester co-op, and summer internship opportunities at their Worcester, MA location. They have 5+ full-time openings for May graduates, and approximately 5 summer internship, and 2 fall semester co-op openings! They will also be interviewing during this event…DON’T MISS IT! Hiring managers will be here for this event looking to fill their openings. AbbVie is one of our top hirers and a Corporate Sponsor of the UMass Engineering Career Center. 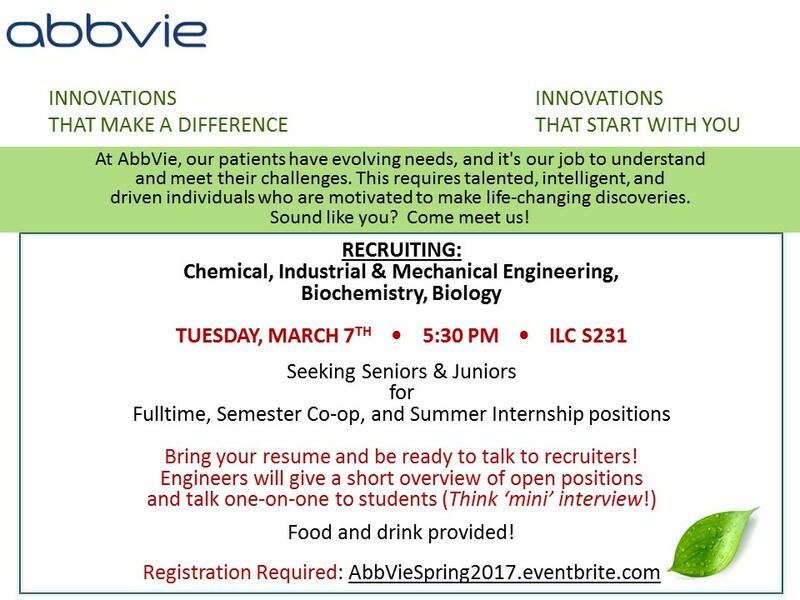 AbbVie engineers will give a quick overview of the positions that are available and then meet one-on-one with all students. Bring your resume and be prepared to talk about your experience and skillset. Casual dress is fine, but neat and clean! Please RSVP at www.AbbVieSpring2017.eventbrite.com so that we can order enough pizza.